According to a new research report by the market research and strategy consulting firm, Global Market Insights, Inc, the U.S. 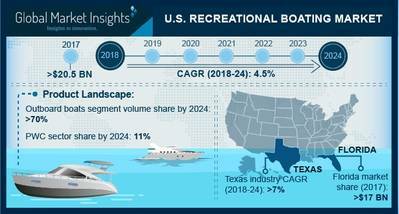 Recreational Boating Market to exhibit around 4.5% CAGR from 2018 to 2024. 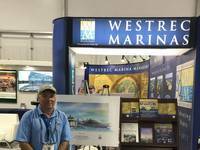 Increasing customer spending for tourism is boosting the U.S. recreational boating market demand. Proliferating usage of boats for leisure and water sports activities such as river rafting, kayaking, racing, and sailing are enhancing the production of pleasure crafts, thereby strengthening industry size over the forecast timeframe. Continuous government support to upgrade and maintain the recreational boating infrastructure will drive the industry share over the forecast timeframe. For instance, in 2015, the U.S. Fish and Wildlife Service through the Boating Infrastructure Grant (BIG) program announced grants of worth over $14 million. 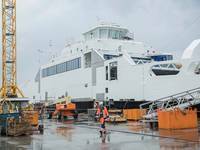 It aims to maintain and upgrade the boating infrastructure along with providing strong support for manufacturers. 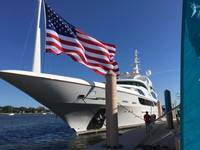 Florida recreational boating industry will exhibit over 6.5% CAGR over the study period. This growth can be attributed to the increasing government initiatives to educate and encourage the participation of customers for recreational boating. The regulations by Florida Fish and Wildlife Conservation Commission mandating minimum safety equipment on boats will further influence the industry growth. The boat shows across the state such as Fort Myers Boat Show, Charlotte County Boat Show, and Bonita Springs Boat Show provides platform for industry participants to showcase their latest technology in boats and attracts boat riders, escalating the U.S. recreational boating market size. Rising number of accidents owing to the lack of knowledge and ignorance of people for utilizing safety equipment such as life jacket are hampering the U.S. recreational boating market share. For instance, according to the United States Coast Guard, in 2017, the recreational boating accidents due to not wearing of life jackets accounted to 370. To overcome this issue, industry participants along with the government are working on educating the boat riders about the benefits of the safety equipment on boats. The U.S. recreational boating market size from the outboard boats segment will capture the highest volume share accounting to more than 70% over the forecast time frame. This growth can be attributed to the enhanced space availability in the cockpit, improved maintenance owing to easier detachment of the engine from the boat, and maneuverability further supporting the industry growth. In terms of power, the engine powered segment from the U.S. recreational boating market share will show a significant growth rate of around 4% between 2018 and 2024 owing to the increasing usage of engines in several boats including inboard boats, outboard boats, and PWCs. The engines powered by ethanol, petrol, and diesel fuels provide alternatives to customers contributing towards the industry revenue share. The stringent regulations by the U.S. Environmental Protection Agency leading to the introduction of hybrid and electric boats will play a key role in driving the business revenue. 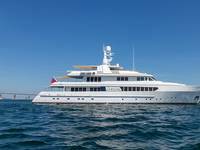 American Sail Inc., Azimut-Benetti Group, Bavaria Yachts, Groupe Beneteau, Brunswick Corporation, and Catalina Yachts are few players of the recreational boating industry. Mergers and acquisitions are among the common strategies adopted by the participants to enhance their product offerings. For instance, in June 2018, Brunswick Corporation announced the acquisition of Power Products for $910 million to complement its portfolio with existing Power Products brands.